Suryamall Mishran, a multi faceted personality, was a towering figure in the field of literature because of his erudite scholarship and unique poetry. According to Dr. Raghubir Singh, the significant tradition of historic poetry started in the middle ages by the outstanding poet Chandra Bardai, was enriched by the works of poets like Virbhan, Karnidan and Suryamall Mishran who was the last but the best exponent of this tradition. 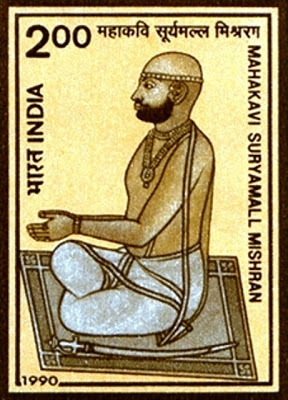 Suryamall Mishran was born of 19th October 1815. Because of his extra-ordinary talent he started writing poetry from early childhood and by the age of 10 years he was able to write the distinguished classic “Ram Ranjat”. The classic describes the then prevalent culture in the society. 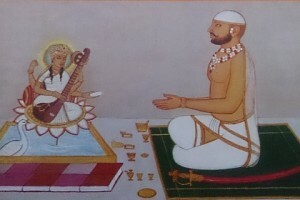 The King of Bundi, while, listening to a recitation of Mahabharat from poet Ashanand inquired if it was possible for anyone to narrate the brave deeds of the Chauhan dynasty in the tradition of Mahabharat in common language. This casual remark of the King fired the imagination of Suryamall Mishran who took it as a challenge and accomplished it by writing the famous “Vansh Bhaskar”, a poetry epic running into 10, 000 pages written in a manuscript by the poet himself. This monumental work is an example of the unparalleled caliber of the poet. He took 16 years to complete this work. India’s struggle for independence in 1857 had a profound effect on the poet and in his poetic language he wrote highly inspiring letters to all Kings, Princess and Zamindars in Rajputana exhorting them to fight against the British. In order to enthuse the people and to motivate them to fight for independence, Suryamall Mishran wrote in 1857, another monumental work in poetry “Veer Satsai”. Though incomplete; this work has tremendous force and vitality. It is an example of patriotism of an exceptional order. 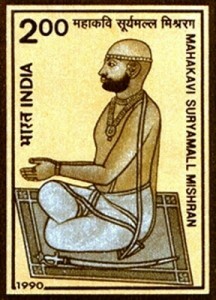 Suryamall Mishran was one of the foremost poets of the 19th century who tried to inspire his countrymen by advocating the spirit of nationalism. Suryamall Mishran’s language and style was characterized by the then prevalent feudal system but the most noteworthy and outstanding feature was his unlimited love for his motherland and deep as well as abiding sense of patriotism. The failure of India’s first struggle for independence cast a pall of gloom on the poet and after about 2 years, the poet gave up writing and devoted his life to the service of his fellow beings. All wealth, name and fame earned by the poet was spent by him on social service. Suryamall Mishran’s life came to an end on 30th June 1868. The Department of Posts feels privileged to issue a commemorative stamp in honor of this great poet. Text: Courtesy Dr. Onkar Nath Chaturvedi. महाकवि सूर्यमल्लजी रो पत्र ! Am proud of u Kaviraj suryamal …….